The Trochu and District Museum is launching two new projects to commemorate Trochu's centennial year in 2011 and needs public participation for one of them. Three Hills RCMP conducted several check stops over the weekend targeting impaired drivers, which resulted in four 24-hour suspensions and one 30 day suspension for a Graduated Driver's License (GDL) driver. Also on the highways identifying aggressive driving. Efforts resulted in 61 charges being laid for various offences including speeding, stop sign violations, suspended driving, and seatbelt infractions. 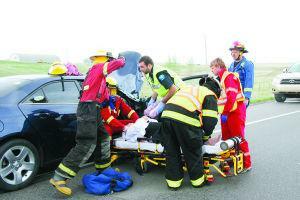 Three Hills RCMP and Emergency Personnel were dispatched to the scene of a two-vehicle crash on Thursday, May 20 at about 2:10 pm. A southbound pickup was attempting to turn east at the Luoma intersection, north of Three Hills on Highway 21, when a southbound car slammed into its rear. Opening night of Disney’s Beauty and the Beast on May 19 and what can I say? The dictionary tells us that an “entertainer” is a person who entertains, especially professionally on stage etc.” And it says that to entertain is “to amuse: occupy agreeably.” I can’t think of any better terms to describe what was presented in this great production of the Three Hills Arts Academy, with Sheila Adkins as the Director.